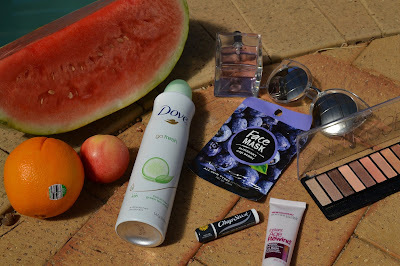 Aside from air con and cool drinks allowing me to survive another ridiculous Perth summer, I've decided to tell you about a few essentials of mine for the summertime. There's a few beauty products and clothing items so enjoy! 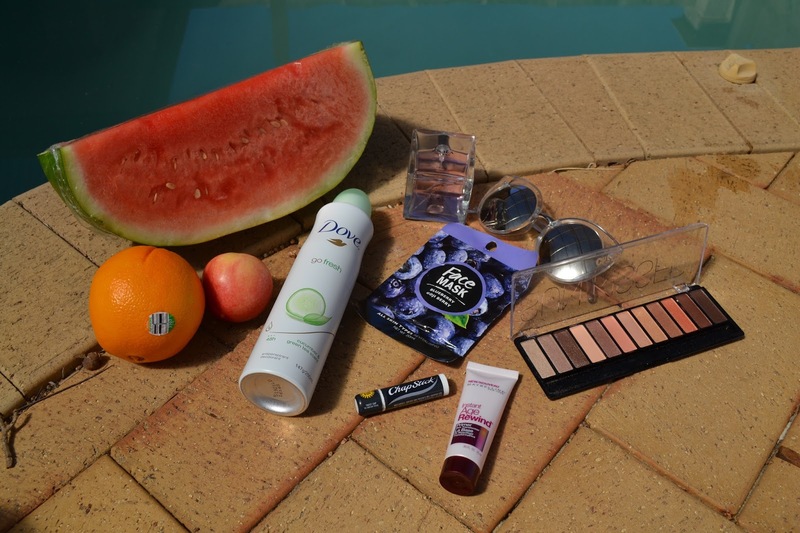 Starting out with the beauty and makeup essentials! I obviously HAD to include deodorant. This is my favourite deodorant in the whole wide world, and I am yet to find anything better than this! This is the Dove Go Fresh Cucumber & Green Tea Scented deodorant. I love this because it is such a fresh scent and it almost moisturises your armpits. The amount of bottles I've been through this is ridiculous. Another favourite of mine this month is face masks. I'm really not too sure how I randomly got into face masks again but I did! I think these are perfect for the summer because they cool your face down and they help your skin while you're at it! This face mask is just a $3 one from Kmart , which work surprisingly well. I also use another one that is from Coles called the Freeman Facial Avocado & Oatmeal Clay mask but of course you could make one yourself for fun too! Another thing I literally cannot live without is Chapstick! I honestly don't know why my lips are always so chapped in summer but I am always carrying 100 chapsticks during this time of year especially! The one I have is just the original Chapstick which I picked up from Coles. A makeup item I have been reaching for all summer is this primer! My friend Taylor actually got me this for Christmas so I'm guessing you can get this from Priceline?? But the Maybelline Instant Age Rewind Primer is the best, this makes my makeup stay on all day without it drooping down my face! Keeping on the topic of makeup my favourite palette in the last few weeks has been this Chi Chi Sunkissed Palette which is available from Myer. Taylor actually got this again for me, cause I was complaining about not having enough orangey tones in my eyeshadow collection. I love these colours cause they easy to blend and can give you a glowy finish if you use the right colours! Since December, I have literally been wearing the same sunglasses until now! These are my favourite sunglasses ever. Not going to lie, these were an impulse buy but I'm so happy I brought them! These are the Quay China Doll Sunglasses which I brought from White Fox Boutique. These are great because they go with almost every outfit ever! The perfume I have been wearing lately is the Zara Women Fruity perfume. My boyfriend got me this for my birthday along with another Zara perfume which I've already finished! This is an amazing perfume for summer because it's such a lightweight perfume and it's not too strong! Firstly, the things I've used most are sports crop tops. Holy moly, I've been using these just to sleep in because of how hot the Perth nights have been! They make me not wake up sweating as much as I would be wearing a proper shirt or PJ's. I just got these 2 from Kmart (P.S these aren't the only 2 I own). Who could forget bathers for summer? 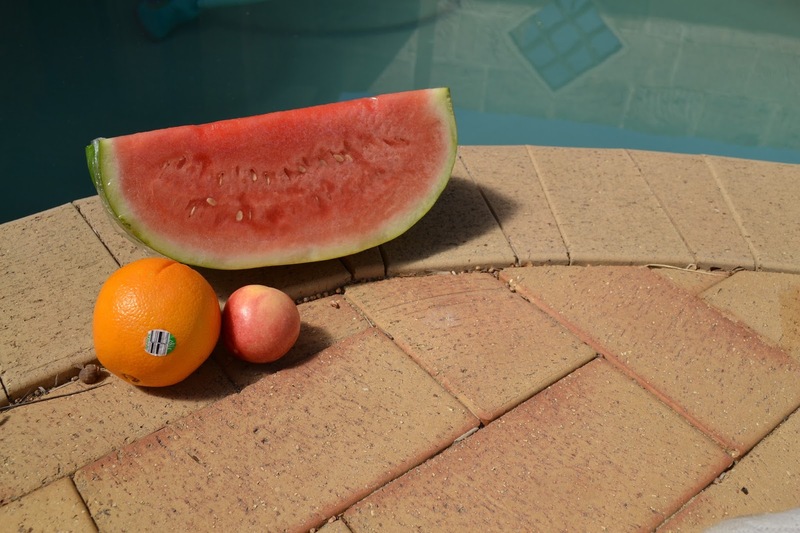 I recently bought these Triangl bathers. I love how reliable Triangl bathers are, they are well worth the money. And how cute are the new designs?? I got these ones because they are super girly and I loveee them! Oh my goodness! One thing I've been wearing non stop in the summer are denim skirts. This white one is my favourite one ever which I bought from White Fox Boutique and I am in love! I love how easy these are to just chuck on but they look so put together. This leads me to my next clothing item which is pretty self explanatory in summer. This is crop tops. These are the best type of top in summer. The one in this picture is from Cotton On. Crop tops are amazing because they are so easy to be put together to be dressed up or can even be dressed down. The last item I have are these shoes! UGH. I love these. These sandals are from rubi shoes and I think they were about $20. I was so happy to get these on Christmas because I didn't have any sandals like this in my shoe collection. I had to get white of course because it's my favourite colour ever but these were such a buy and I've already got my moneys worth in these shoes! I hope you enjoyed this post! And let me know any essentials i may have missed! © 2015 Shann0n-Renae. Ashleigh Template designed by Georgia Lou Studios All rights reserved.